Stars are among us! 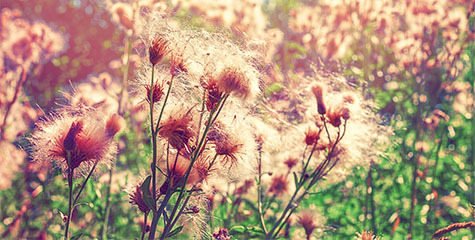 They also decorate our bodies, walls, smartphones… One moment, what are we talking about? The galaxy pattern, of course! 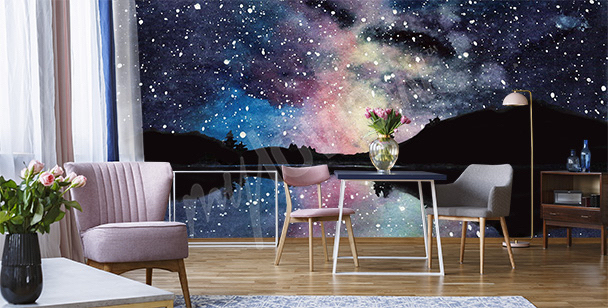 If you haven’t heard of a galaxy pattern on a space wall mural before, then you must’ve just returned back from a journey through space, just like a main hero of Stanisław Lem’s Return from the Stars, and you’re just finding out what happened on Earth during your absence. 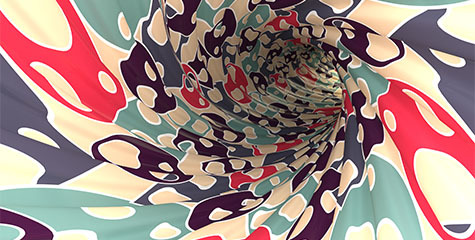 Well then, welcome back and allow us to enlighten you: the galaxy pattern is a motif inspired by space photography. Colorful nebulas, comets, constellations and other astronomical objects are graphically tweaked in a way that we can look at them as if we probably would if our eyes weren’t so weak. 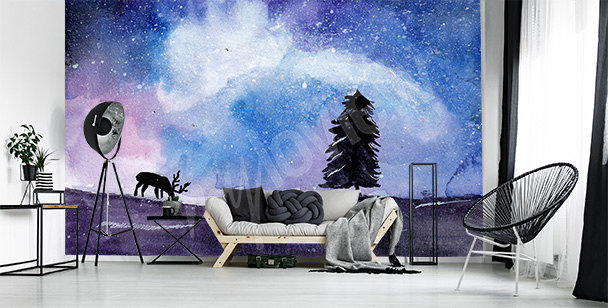 A mural with an image of cosmos is an original living room decoration. It will look best in simple, modern interiors. If you want your child to be curious about astronomy, a great way to spike their interest would be a mural with a funny planet motif. For fans of modern decorative solutions, we offer a mural with cosmos in an abstract, original version. 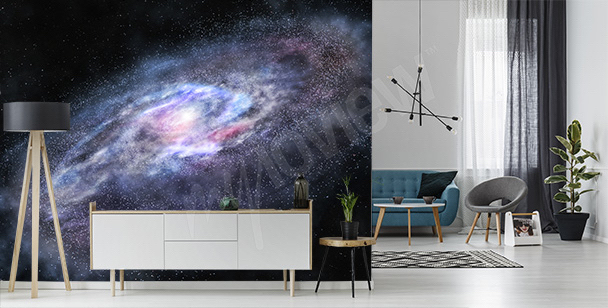 A mural with a colorful image of the galaxy will spice up your interior, adding some toned-down color to your décor. 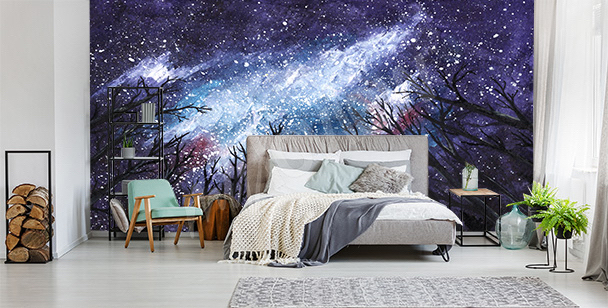 A modern wall mural with a nebula in darker shades is a perfect choice for a bedroom – cosmic dreams guaranteed! Cosmos is full of wonders. Nothing should stop us from placing one of the discovered ones on our wall! Solar eclipse is one of the most interesting cosmic motifs on wall murals. 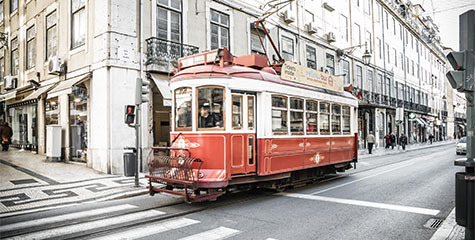 It fits well with ascetic interiors and simple accessories. 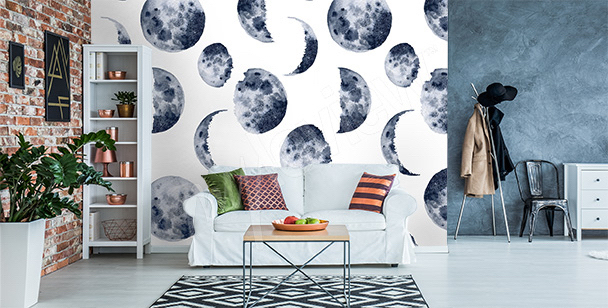 A black and white mural with the Moon is a great decoration for a minimalistic living room. 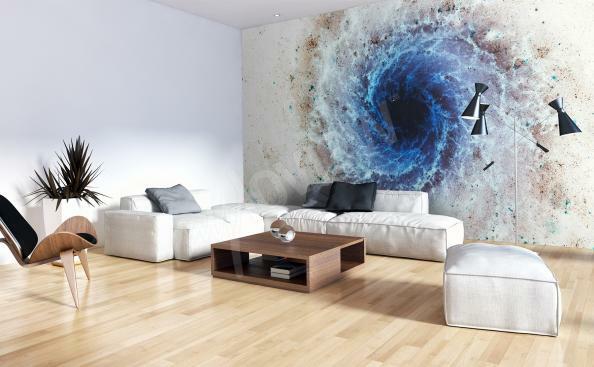 An extraordinarily dynamic mural depicting a Supernova will easily chase away the boredom of your interior’s design! A characteristic mural with a cosmos image is a great solution for challenging interiors, such as bathrooms. 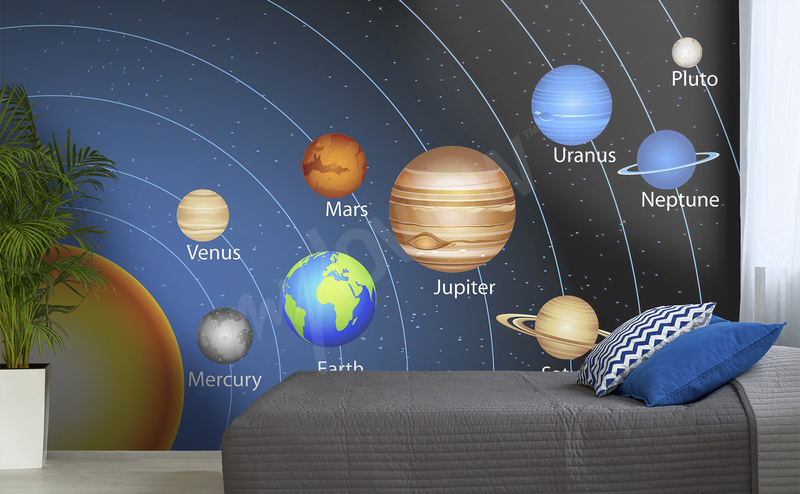 An original mural with the Solar System will look great not only in a child’s room, but also in the „adult”, modern interiors. A mural with an image of a full moon is a mysterious and climatic offer for all fans of astronomical phenomena. 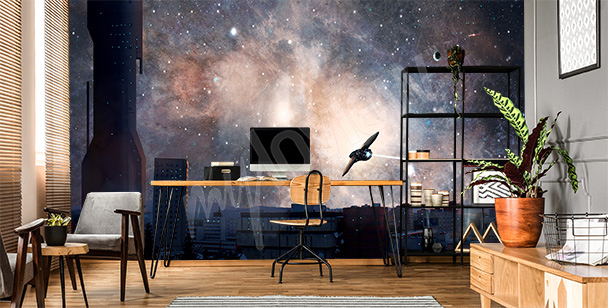 Four flavours of galaxy: how to decorate an apartment with use of hd space wallpapers? Of course, the vast majority of popular “cosmic” designs that decorate clothes (not only in retail chains, but also in collection created by leading designers!) 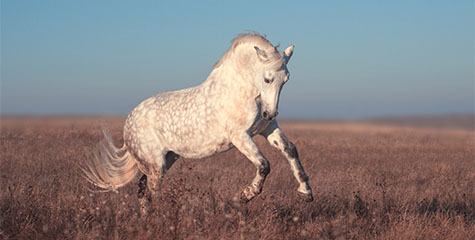 and other items aren’t real cosmic photographs, rather than graphics created on a computer, inspired by the real images. But so what? Nothing, really. The galaxy pattern won our hearts not with its reliability and educational value, but with it’s incredible look, so different from everything we’ve seen before! 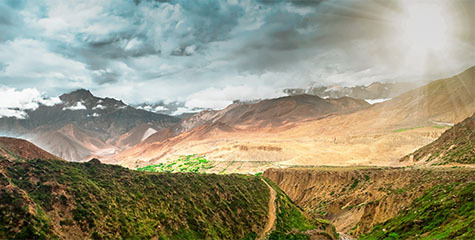 We may not know whether a given photo is real or not, but one is certain: it looks absolutely fantastic on 3d space wallpapers. How to use cosmic patterns to create a unique decor of your apartment? Here’s some of our ideas! Aside of murals with a cloud pattern, cosmic patterns are probably the best possible choice for ceiling decoration! 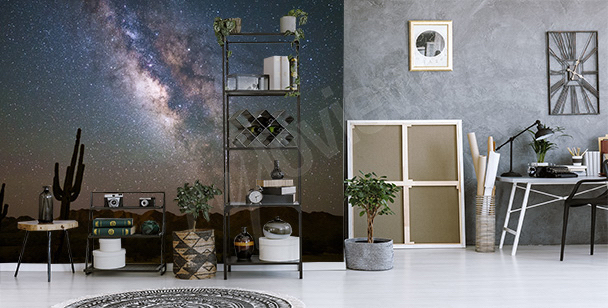 By sticking a space wallpaper 3D to it, you can create a truly interesting decoration: and not just because galaxy motif on a space wall mural is an interesting, bold pattern, but mostly because ceilings are often ignored as something that could be improved in any way! 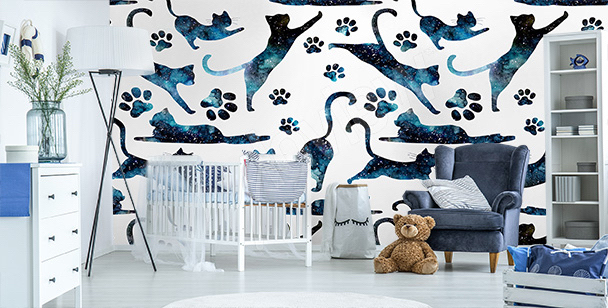 Say “no” to white ceilings and create a cosmic decoration, perfect for both - children and adults alike - with help of a mural! Small apartments are the true nightmare of modern times: we’re actually quite used to such spaces! 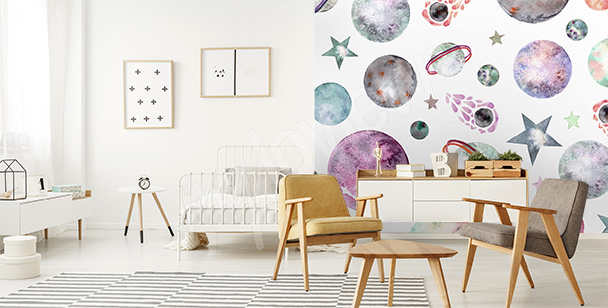 Thankfully, even the tiniest of living rooms and bedrooms can be easily enlarged with help of a space wall mural (unfortunately, only in a visual sense!). 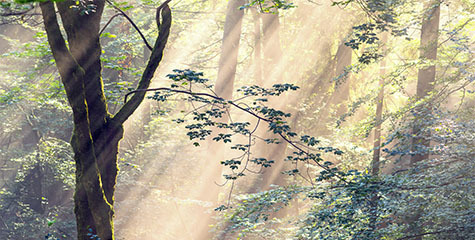 Applying it to a wall will create a sense of (cosmic!) space and will make an interior seem bigger than it really is. If you want a really strong effect, choose space 3d wallpapers (it’s best to select one, wide graphic and stick it on two neighbouring walls): a cosmic pattern look especially good on them, and the impression of a bigger space is even stronger! When galaxy patterns appeared in the fashion industry for the first time, they were never considered as something that could appeal to children. But when you think about it, it’s easy to see that cosmic motifs are a truly fantastic idea for a decoration of a child’s room! 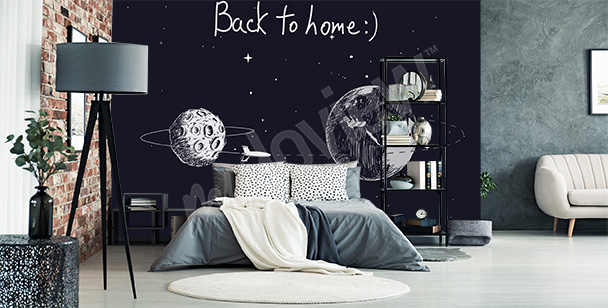 If your son or daughter loves to watch sci-fi movies or dreams, that one day they’ll work as a n astronomer, a space wall mural for children will be something just for them. Add to it a couple of other decorations and gadgets inspired by science fiction, space travels and astronomy (for example, fitting curtains, linens, toys, books, posters and so on), and you’ll easily create a stylish thematic decor that will awe every single of the future Armstrongs and Tereshkovas! No, it’s not like that! 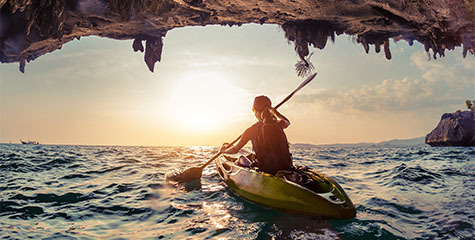 We mean as a decoration of other interior than a child’s room: like a living room, or a bedroom, a bathroom, front hall, perhaps? 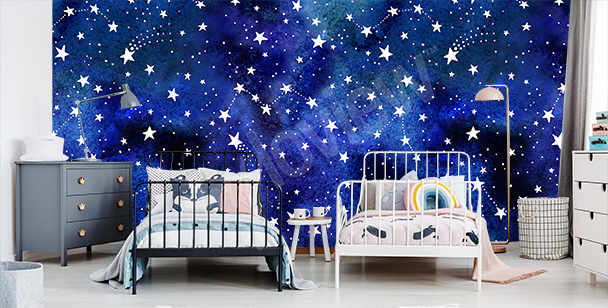 As we’ve mentioned before, there’s nothing in galaxy pattern, especially in space wall murals (mainly in the HD ones that are very realistic - if we may say so about tweaked photos) that screams “It’s for children, only!”. 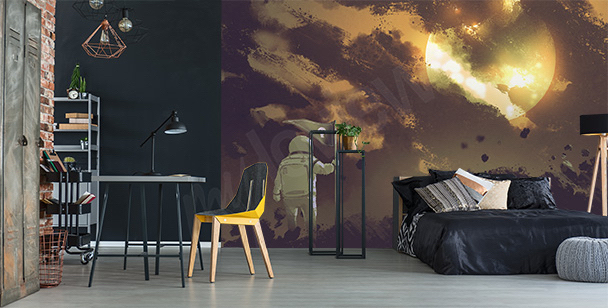 Combine a mural with a minimalistic decor (it’s best to leave the remaining walls white) or maybe with a bit more futuristic accessories if science fiction is something close to your heart, and voila! 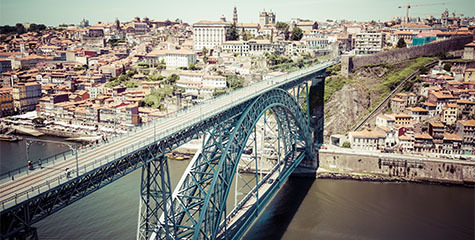 : now you have an interesting and simultaneously modern and romantic (all those stars…) decor, that will make all of your friends impressed and envious!